Our work starts and ends with our clients, so here are a few examples of how LED lighting has transformed their working spaces. We look forward to adding your story to this page! Bicester Learning Academy’s The Cooper School have installed LED lighting to provide a carbon saving solution and minimising environmental impact. The Cooper School have installed Ultra Slim Ceiling Panels to replace lighting in its classrooms, which provide high performance, attractive LED lighting. The ultra slim ceiling panels which come in a variety of sizes, give off more light and run at 40% of the power of florescent tubes; which will provide the school with a great opportunity to benefit from substantial energy and cost savings. The Manor School is a delightful and exceptional centre for primary special education. The School aims to be a centre of excellence which delivers opportunities and experiences to assist pupils to accomplish their full potential. 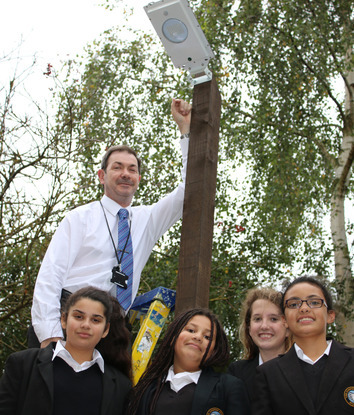 Brent Council began a trial on LED lighting and used Manor School as the test case. Previously the school had been using traditional fluorescent T8 technology which did not provide effective and reliable lighting and the flickering light interfered with the teaching equipment. Maintenance costs were also very high due to the lamps constantly failing every 6-12 months. Zeta Specialist Lighting worked closely with Brent Council and the School to optimise the lighting levels and controls, allowing energy savings by a reduction in the total consumption as well as incorporating dimming controls. Zeta replaced all of the current fittings in the classrooms with 1200 x 600 LED Ceiling Panels which were also made dimmable. Zeta then revamped the halls and stairwells with Retrofit LED Tubes and installed 600 x 600 LED Ceiling Panels in the theatres and assembly halls. 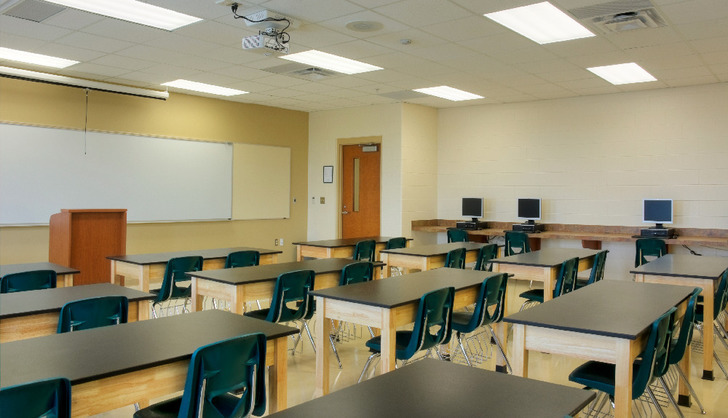 Maintenance savings were achieved as the LED Celling Panels have an expected lifetime of over 10 years, which was perfect for the school environment. The LED Ceiling Panel’s power supply was designed to work on the current traditional wiring, meaning the installation could be completed 50% more cost effectively and therefore within the School’s budget. Safik Meah, Head of Facilities at Manor School. 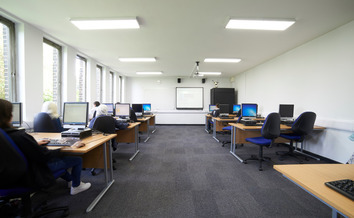 Activate Learning, an educational organisation based in Oxford, comprising three FE colleges and two technical colleges, has refurbished its Banbury and Bicester College campus, utilising LED lighting supplied by Novalux partner Zeta Specialist Lighting. 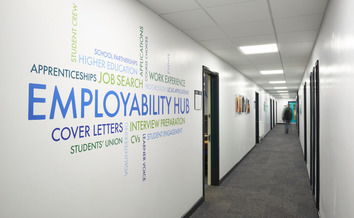 As part of an ongoing refurbishment project, the college wished to smarten up the main corridor linking the main reception area with the classrooms; a ‘gaming’ area for students, as well as the IT learning room. 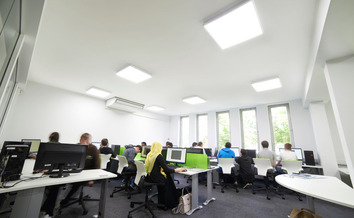 The brief to potential suppliers included a requirement for energy-efficient lighting solutions that would reduce the college’s energy bills, and one that would lessen the workload of the college’s maintenance team – it was key that the recommended products were long lasting and required little or minimal ongoing maintenance. Zeta Specialist Lighting was selected as the preferred supplier on the basis that their proposal met the brief. In the main corridor Zeta supplied and installed seventeen Ultra Slim Ceiling Panels which provide high performance, attractive LED lighting. These were supplied with eight Zeta Emergency Kits providing emergency back-up and supplying over three hours of emergency mode lighting, at an ultra-low 5W. A further twelve Ultra Slim Ceiling Panels were surface mounted in the gaming area again providing superior light at a fraction of the cost of the legacy lighting. The third area to be revitalised was the IT learning room and here Zeta supplied eight surface mounted Ultra Slim Ceiling Panels. With a thickness of only 7mm, the ultra slim design allows for easy installation and offers an enhanced aesthetic appearance once in-situ. Plus Zeta’s Ultra Slim Ceiling Panels are available in bespoke sizes and either as surface mounted or recessed luminaries. For the college, this meant that the panels were created in a variety of sizes suited to each individual area; so for example within the main corridor each of the panels was 600x600mm in size and the IT room was fitted with eight 1200x300mm surface mounted ultra slim panels. The Ultra Slim Ceiling Panels also give off more light and use significantly less power than florescent tubes. A standard florescent tube has an average rated life of 15,000 hrs while Zeta’s LED ultra slim panels last for 50,000 hours (average rated life). This means that the college will benefit from reduced energy bills, something that was integral to their requirements and it’s estimated that they will achieve an annual cost saving of around 50%. 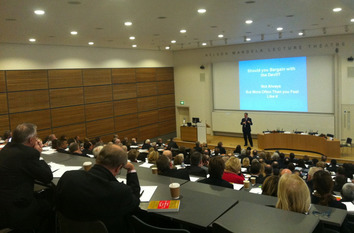 Saïd Business School blends the best of new and old. A young, vibrant, and innovative business school that’s embedded in an 800 year old world-class university offering world class education. 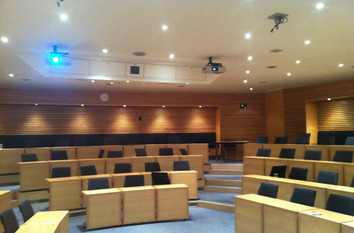 With a requirement to install LED lighting in a new building designed to support its expansion plans as well as upgrade the existing lighting in its lecture theatre, Saïd Business School approached Zeta Specialist Lighting for a solution. The system needed to provide bright, even illumination as well as interface with the legacy dimmer control system. Following a site survey, Zeta recommended illuminating the area with its energy efficient LED Lamps. The superior LED lighting unit complete with an interface to the lighting dimmer controls, delivered a smooth responsive lighting system that met the client’s brief, in addition to providing reduced energy and maintenance bills.